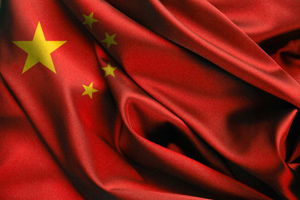 China is forecasted to be the second largest pharmaceutical market in the world by 2015. In many ways, it is shaping up to be the model of opportunity that the pharmaceutical industry had envisioned for the emerging markets. China is intriguing but remains an uncharted territory for many Western pharmaceutical companies. Pope Woodhead's understanding of this market has been facilitated by recent discussions with stakeholders associated with policy reform and hospital care provision in China. 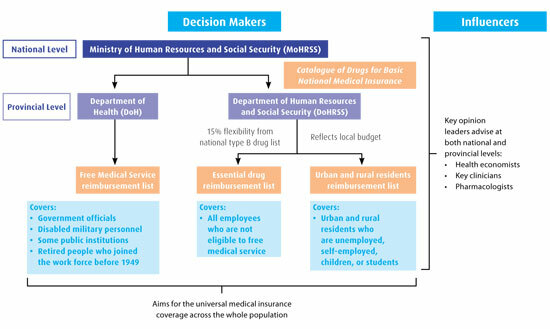 The Ministry of Human Resources and Social Security (MoHRSS) publishes the Catalogue of Drugs for Basic National Medical Insurance, which lists all reimbursed drugs. 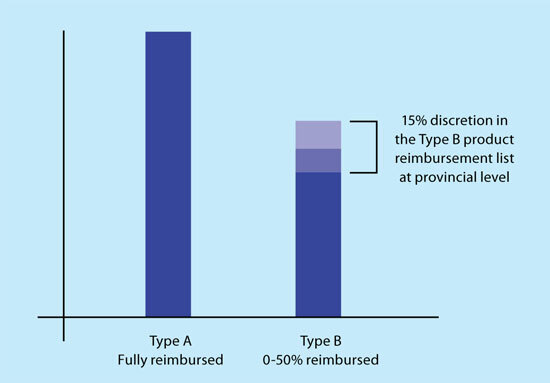 These are either Type A (fully reimbursed, essential generics) or Type B (patient co-pay of 0–50 per cent depending on provincial government policy and insurance coverage). Importantly, provinces are given the power to customise, expand or reduce the products on the central Type B product list by up to 15 per cent to reflect the local budget and healthcare priorities (Reimbursement Types A and B, opposite). For example, Zhejiang Province and the Beijing and Tianjing areas have a higher than average rate of lung cancer, and there are indications that they will supplement the Type B list with newer therapeutics in the future to address this priority. In addition to this flexibility, provincial governments create their own reimbursement lists: Free Medical Service, essential drug (for urban area employees), urban area resident and rural area resident reimbursement lists. 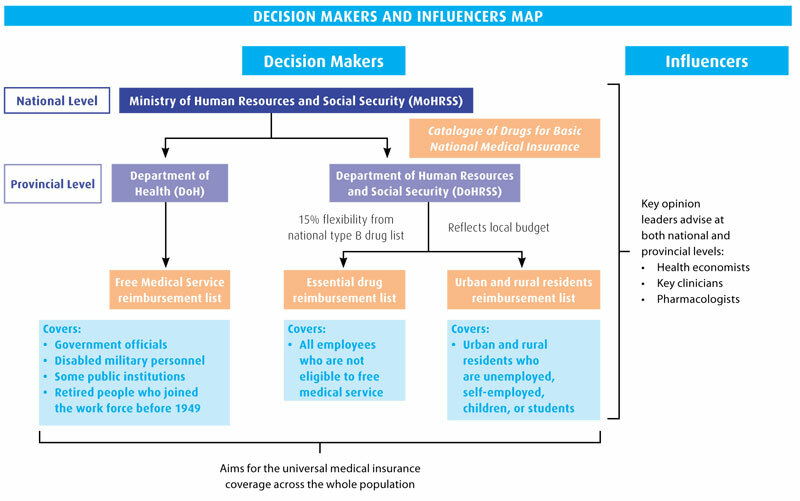 The local Free Medical Service reimbursement list is determined and generated by the Department of Health (DoH), while the other reimbursement lists are managed by the Department of Human Resources and Social Security (DoHRSS) in the local provinces (Decision makers and influencers map, below). Discussions with payers from these departments have revealed that the candidate drugs for reimbursement are mainly those that are widely prescribed in hospitals and pharmacies, and the number of candidates reflects the local budgets. In addition, expert clinicians can nominate other products that have shown an excellent efficacy/risk balance for certain severe/chronic diseases, but may not be widely prescribed. Expert clinicians, alongside pharmacologists and healthcare economists, influence decisions on the final reimbursement list (Decision makers and influencers map, above). Usually, the Free Medical Service list includes more Type B drugs and novel therapeutics than those available via other medical insurance systems due to the priority endowed to its covered populations. They cover approximately 60 million people including high-level government officials (either in service or retired), employees in public institutions, disabled military personnel and eligible retired citizens. However, there is a trend to narrow the coverage of the Free Medical Service and/or assimilate its reimbursement list with the corresponding local essential drug reimbursement list. The local essential drug reimbursement list is managed by the corresponding DoHRSS at provincial, city and county levels. Based on the Catalogue of Drugs for Basic National Medical Insurance, local essential drug lists reflect the local budget and healthcare priorities. It covers the employed population and is co-funded by local government, employers and individuals. Urban area resident and rural area resident reimbursement lists are managed by the same bureaus as the essential drug reimbursement list at local level, and cover residents who are not employed or self-employed in urban areas, and farmers in rural areas, respectively. They are mainly funded by local government with a minor contribution from individuals. Fewer drugs are included on these lists compared to other reimbursement lists, and the drugs are mainly generic. The National Development and Reform Commission (NDRC) is the umbrella governmental organisation responsible for making pricing policies, and it has overall control of the price of medicines. In June 2010, the NDRC released a draft version of the Opinions on Drug Price Control policy, and called for a public consultation with industry associations, including the R&D-based Pharmaceutical Association Committee (RDPAC) and the China Pharmaceutical Industry Association (CPIA). In this document, the NDRC stated that the basic principle of its pricing policy focused on encouraging R&D and drug innovation, clinical benefits, drug quality, reasonable affordability of patients' co-pay and out-of-pocket payments, profit control and sale discounts. For products listed in the essential drug reimbursement list, the price is set and scrutinised by the government to support nationwide accessibility. However, for novel drugs under patent protection, instead of providing official price recommendations immediately after market launch, the NDRC typically requests provincial government pricing agencies to record or set a temporary price during the first year. After the analysis of market sales and a period of bidding, price negotiation and local procurement activities between the government and pharmaceutical company, the market-adjusted price tends to settle across regional markets. The NDRC then sets a price ceiling by considering a product's cost, insurance and freight (CIF) price submitted by manufacturers, tax, profit margins, international price references, as well as national market-adjusted prices from the temporary sale history. Usually the NDRC sets prices for a class of drugs. In 2009, a pilot programme was initiated in Guangdong Province to allow manufacturers to appeal for higher prices based on the product profile and drug quality. This test programme is predominantly applied to patented drugs, first-to-copy generic drugs, and products of significantly higher quality compared to competitors. The applications are reviewed and assessed by key opinion leaders in the relevant disease areas. Approved products can achieve a 15 per cent price increase above the ceiling price, (Influence factors on drug pricing in China. Dissertation - Memoire No. 154, published in October 2010). The success or failure of such a system will profoundly impact the future drug pricing policy in China. A mixture of an ageing population, increasing wealth, urbanisation and the recent and continuing healthcare overhaul, has driven dramatic organic market growth in China, and the attention of international pharmaceutical companies. Although there are great opportunities in accessing the Chinese market, there are still uncertainties and hurdles that pharmaceutical companies must consider. The 2009 Chinese medical reform heralds large-scale healthcare expansion with wider reimbursement coverage and more affordable medicine. Furthermore, greater health awareness and purchasing power of Chinese families will generate demand for innovative and more effective treatments. Nevertheless, companies will need to stay vigilant to address market challenges. Understanding the structure of China's healthcare reimbursement system is the first step to clear the mist and visualise opportunities and challenges. Pharmaceutical companies need strategic approaches to engage proactively in China and ride the tide of healthcare expansion. Next month find out how to map out the steps to market access success, including how Western pharma can develop reimbursement strategies for innovative pharmaceuticals. Wenting Zhang and Rebecca yanhui Zhang are consultants in Pope Woodhead Pharmaceutical Consultancy and Chris Easley is Principal at Pope Woodhead & Associates. The authors wish to acknowledge Dr Francois Lucas for his advice on this article.